Rest in Peace, George Carlin, If You Can. • Canticles 3: 1-4 (or II Corinthians 5: 14-17). • Psalm 63: 2-6, 8-9. • John 20: 1-2, 11-18. The Third Class Feast of Saint Mary Magdalene, Penitent. • Canticles 3: 2-5; 8: 6-7. • Psalm 44: 8, 3. The Ninth Friday of Ordinary Time; the Feast of the Holy Myrrh-Bearer Mary Magdalene, Equal to the Apostles; and, the Feast of the Translation of the Relics of the Holy Bishop & Martyr Phocas. • II Corinthians 1: 12-20. • I Corinthians 9: 2-12. 9:43 AM 7/22/2016 — It's not uncommon—and you have have heard it, I'm sure—to hear a comedian introduce a stand-up routine by pointing out that he or she was raised as a Catholic, and therefore grew up with a sense of guilt. This, then, becomes the premise of a series of jokes—sometimes funny, mostly not—which usually ends up holding the Church and the Faith up to ridicule. The reason these jokes work is because of the wide-spread assumption, foisted on us by modern pop-psychology, that guilt is something bad, and that feeling guilty is, somehow, psychologically unhealthy. Not only is there nothing wrong with guilt—not only is it not unhealthy to feel guilty when one has sinned—but, in the context of our relationship with God, it is absolutely essential. The premise that guilt is unhealthy is predicated on the presumption that there's no such thing as sin, but there is. The saint whose feast we celebrate today was one of the most important and outstanding disciples of our Lord, and would not have become such had she not felt guilt. Guilt, and the feelings of remorse that go with it, is responsible for the lives of the some of the greatest saints in the history of the Church, many of them martyrs. Guilt is the seedbed of conversion; without guilt we do not repent of our sins, and without repentance we don't grow in Grace. The Gospel lesson for this feast of Saint Mary Magdalene does not present to us the story of her conversion and repentance, as you might expect, nor even of the exorcism of the demons which possessed her; instead, it shows us the fruits of it. 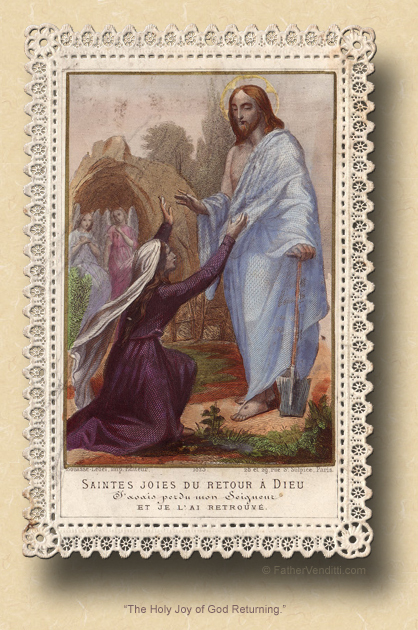 Having embraced her guilt, motivated by it to change her life and devote her life to Christ, she was given a Grace that was denied even to the Apostles: she was the first to see the Risen Lord. There is a lesson for us in that: Grace comes only to those humble enough to know they need it. * This is the Gospel of the woman caught in adultery washing the feet of our Lord in the home of Simon. 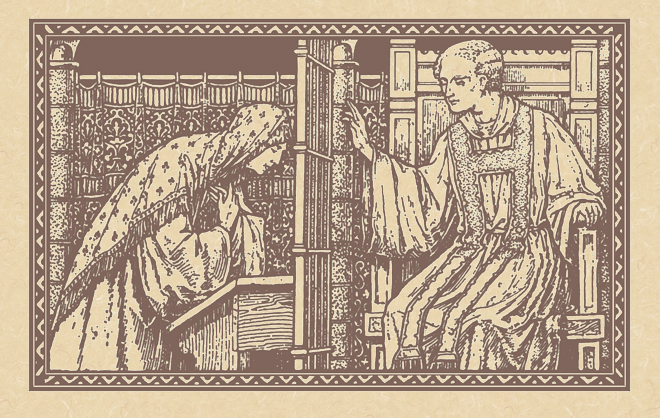 Pope St. Gregory the Great was the first to identify the woman in Luke 7 with Mary Magdalene (cf. Homily 33 on the Gospels). While Scripture scholars will continue to debate the issue—and Protestants, for the most part, reject it—the identification has become integral to Catholic devotion to the Magdalene. The Ordo of the ordinary form of the Roman Rite for the Province of Newark says, explicitly, that this identification is "mistaken," but cites no source; certainly there is no definitive teaching from the Church on the subject after Pope Saint Gregory's identification, and even a near universal consensus of Scripture scholars would not constitute the teaching of the Church. If, on the other hand, the opinion of the editors of the Ordo is to be considered normative (though it is unclear on what authority), then this homily is still applicable in and of itself, and certainly is if one celebrates according to the extraordinary form, in which Mary Magdalene is specifically classified as a penitent. The story of the woman caught in adultery (John 8: 1-11) is found mostly in old Latin manuscripts of John's Gospel, and in different places, sometimes at the beginning of chapter 8 as in modern Bibles, sometimes after 7: 36 just prior to our Lord's discourse on the last day of Pentecost, and sometimes at the very end of the Gospel. A few manuscripts include it at the end of Luke 21 just before the beginning of the Passion narrative, or at the end of his Gospel after the resurrection. Though Luke is generally regarded as the author, it is clear that it was never an original part of either Gospel, but inserted later, probably because of the allusion to Jeremiah 17: 13. Nevertheless, the Catholic Church has always accepted it as canonical, and part of the Gospel of Saint John; Saint Jerome certainly did.